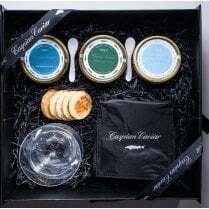 A special selection of the three classic caviars that were synonymous with the Caspian Sea all in their traditional liveries of Blue for Beluga, Green for Oscietra and Red for Sevruga, presented in one of our lovely gift boxes. This is a very smart gift for anybody who enjoys the good things in life. 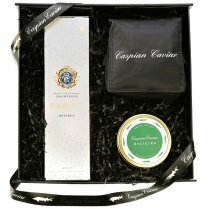 Tackling a range of caviars is my favourite way of eating caviar. You can really identify the differences, have a debate, find your favourite and generally have fun. 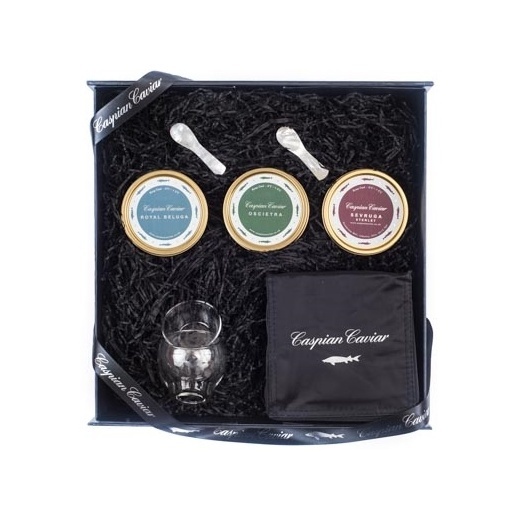 We have added a caviar bowl and a horn spoon. All our Triliogies are offered at a discount to the sum of the parts: 7.5% for the 30g, 10% for the 50g, 12.5% for the 125g and 15% for the 250g. A delicious Huso/Baerii hybrid Beluga caviar farmed in Italy. It has the egg size and the flavour that you would expect from Beluga, although the eggs are a little darker than a pure Beluga. This hardly seems the end of the world as it is considerably cheaper! A real caviar star. We regularly proclaim our Oscietra to be the best around, particularly at this price, and no one has yet disagreed. This caviar has a much smaller egg than the mighty Beluga Caviar, but what it lacks in egg size, it makes up for in flavour. It is often described as the "connoisseur's caviar" due to its stronger flavour. Soft, grey eggs. Two piece glass bowl - just ideal for serving caviar. Hand made in England and very tactile. 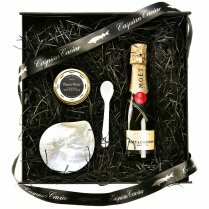 All boxed up in a Caspian Caviar Gift Box, complete with ribbon.